A monk sits, furiously scratching away at his parchment. It is near dawn and his candles have burnt down to near nothing. Still, he cannot rest until he’s finished. He won’t rest. Open jars of grains surround him, some spilled next to his parchment. He runs his hands through them before bringing them to his nose. He smiles as he lifts his parchment into the light. After countless experiments, this is it. The perfect recipe. A beer fine enough to share. This Monk isn't your typical devotee. He has an unmatched passion for his craft and the will to go anywhere to find the right ingredients. And tonight, his devotion to his craft has paid off. The brewing process relies on 4 main ingredients. Malt barley (or other grain), hops, yeast and water. The majority of the malt we use is locally grown in the fields of Alberta, but we also source malt from other parts of the world. We use Canadian hops whenever possible and also source hops from the US, Europe, and New Zealand. Our water is local, filtered Red Deer water. Our brewery is built around our 15 barrel brewhouse. It also includes four 15, four 30 and seven 60 barrel fermenters. It contains one 10, one 15, two 30, and three 60 barrel brite tanks. We've recently added a 500 litre still, and two fermenters designed for spirits. Graeme is an integral part of the Troubled Monk. His focus for the brewery is on quality and direction. He has the ability to look at everything in a unique way, combining Art and Science. Since opening Troubled Monk with Graeme in June 2015, Charlie has focused the majority of his time on the business side of the brewery. Charlie has a passion for Red Deer and anything local. His intent has been to supply Red Deer and the rest of Alberta with world class beer and have a ton of fun along the way. Garret joined Troubled Monk after graduating with distinction from the first year of the Old's College Brewmaster program. He joined Troubled Monk early on, developing Troubled Monk's 4 core recipes. Garret has been an essential member of the team, and has contributed greatly to the success of the brewery. Bud looks after local sales right here in Red Deer, as well as Southern Alberta. Bud offers an abundance of fresh, new ideas. He has a love of beer and people, as well as the most ironic name in all of craft beer! Chris joins the Troubled Monk team with a ton of liquor store management and beer sales experience. 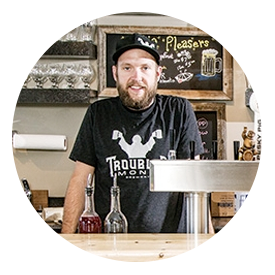 Having entered the industry in 2011, he has been propagating the craft beer explosion in Alberta ever since. He is currently working towards closing in on 3000 individual beer reviews. Faye joined our sales team in October 2018. She comes to us with many years of customer service experience and a love of craft beer. She has been immersed in the craft beer scene for the last 3 years as a consumer and is excited to be a part of the Troubled Monk team! Tanis joined the team in fall of 2017. She looks after all things involving the taproom, as well as promotions, community engagement, events and social media. She enjoys being a part of the dynamic Troubled Monk team, as well as the exciting craft beer industry! Originally from Kelowna BC, Jesse moved to Alberta 5 years ago. He has been home brewing for 4 years, and joined the Troubled Monk team in August 2016. He loves to snowboard, fish, travel, and drink beer. Starting as a home brewer just over three years ago, Andrew is happy to be a part of the team of brewers at Troubled Monk. Steve’s expertise for beer shines as soon as you discuss the topic with him. As a BJCP recognized judge, and a Cicerone Certified Server, Steve is brimming with opinions and enthusiasm surrounding beer! Eva has great enthusiasm for Troubled Monk beer, as well as for her customers. She is fantastic at engaging customers in Trouble Monk, and all it has to offer! A performing arts graduate, Jennifer recently returned to Red Deer after 3 years at sea with Disney Cruise Lines. She is a Red Deer native, and a fantastic addition to the taproom at Troubled Monk. Arisha can normally be found developing delectable potions in the R&D lab or walking around with samples for everyone to try. Her dream is to develop the best spiked butterbeer that would make Harry Potter choose Troubled Monk Brewery over the Three Broomsticks Inn. Al started drinking beer at his favourite 1,000 year old pub in Buckinghamshire, England. A couple years ago, he found his way to (not so local) Alberta, and joined the Troubled Monk team as a brewer in August 2017. He is excited to learn all there is to know about distilling alcohol. Lauren is a native Red Deerian, and an avid Quidditch player and coach. Lauren is working towards her degree in Business Administration, and looking forward to joining the Troubled Monk team! Favorite Style: All of it! Vanessa moved from Toronto to Red Deer because she heard the beer was better. She is a second year accounting student at the Donald School of Business, and a promising athlete in any Beer Olympic activities. Prior to working at Troubled Monk, Jamie was accepted into the space engineering program at NASA, which she turned down for a more lucrative position pouring some of Craft Beer's finest. In her spare time she enjoys music, and playing in a band. Look for Ben at tastings and beer events in the Edmonton area! Things in the back are always changing, and a tour is a great way to get better insight into how our delicious craft beer is brewed!